Kiesub Electronics is also a full service Contract Manufacturer. Started in 1995, Kiesub has been building cable assemblies, wire harnesses, battery packs, turnkey box builds, and now LED signs, panels, shelves, and other creative LED projects. Our manufacturing capabilities include machine harnessing, cutting & stripping, electro-mechanical & panel assemblies, kitting & custom packaging, and more. We have full engineering capabilities and can help you design your next project. We can provide CAD/CAM drawings, board layout design, enclosure design and other engineering services. Trained and certified operators recognized by IPC A-620 ensure that the quality level of our products meets or exceeds your highest expectations. Request a quote with our form below, call us at (702) 733-0024 x120, or email us directly. 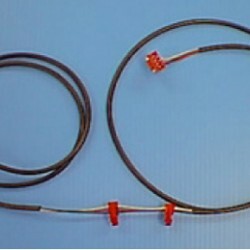 Kiesub makes custom wire harnesses for every industry. 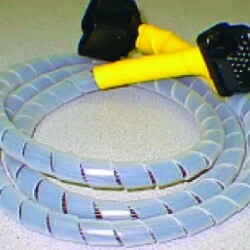 Using a cable tie gun speeds up the manufacturing process. All production operators are trained and certified to IPC A-620 standards. 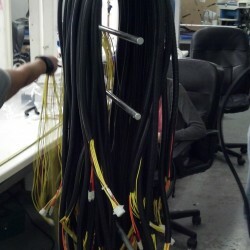 We build all types of wire harnesses. 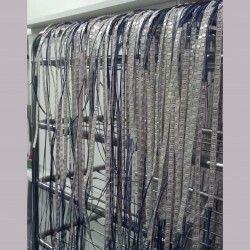 We have been making harnesses for slot machines since1995. LED strips after pre-wiring for installation into panels. 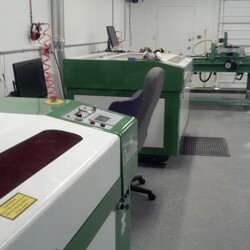 Two of our Laser Cutting Machines shown here. 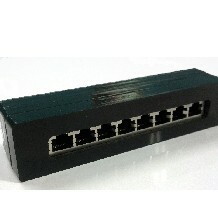 Data block designed and built by Kiesub.